Indiana returns to Assembly Hall tonight for a primetime matchup with No. 15 Iowa. The Hawkeyes are 19-6 overall and 8-4 in the Big Ten. There’s a three-team race for the 2013-2014 Big Ten regular season championship. Indiana’s opponent tonight, Iowa, is in the thick of it, but can probably only afford one more loss at most if it hopes to remain there. So what does this have to do with Indiana, you ask? Well, the point is that the Hoosiers still have a seat at the table in terms of determining who wins the Big Ten. The Hoosiers have already knocked off Michigan and Wisconsin at home and tonight’s game at Assembly Hall is pivotal for Iowa to remain in the race. This is the type of game Indiana has played its best in over the past few seasons: Big stage, ranked opponent and something to prove. With its first three-game losing streak of the season, will the Hoosiers take another punch or hit back? When Fran McCaffery took over a depleted Iowa program for Todd Lickliter, this is the year he was building toward. It’s year four in Iowa City and McCaffery has constructed a roster that is deep, versatile and experienced enough to make a run in March. McCaffery isn’t piling up highly rated recruiting classes, but he’s assembled talent that is now seasoned enough to finish in the top three of another brutally tough Big Ten. 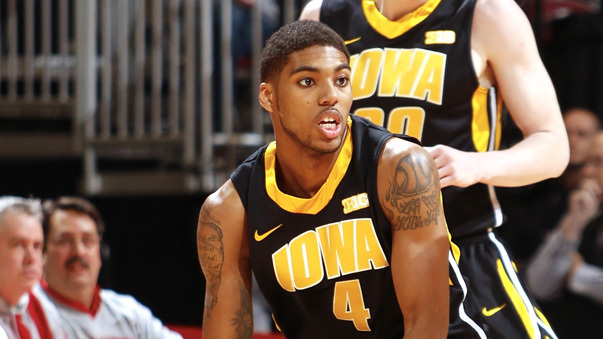 And while Iowa’s future appears stable, this is probably as good of a year as any for the Hawkeyes to make a run as their best offensive player, Roy Devyn Marble, is a senior. In league play, Iowa is playing nine guys 15 or more minutes per contest and a tenth man, Anthony Clemmons, is playing about eight per contest. The offense, the second best in the Big Ten with 1.13 points per possession, is led by Marble, who is averaging 17.6 points in conference play with an effective field goal percentage of 49. Marble is using 27.2 percent of Iowa’s possessions, which hurts his efficiency a bit, but he’s good enough to take over a game. Iowa’s most efficient player is junior forward Aaron White, a teammate of Yogi Ferrell and Will Sheehey over the summer in the World University Games. White is making 62.8 percent of his 2s in Big Ten play and his free throw rate (FTA/FGA) of 66.3 is third in the conference. In addition to White, Iowa’s frontcourt rotation also features senior Melsahn Basabe, Gabrial Olaseni and Adam Woodbury. This trio has the potential to cause major foul issues for Noah Vonleh, so it’ll be interesting to see how McCaffery chooses to attack the paint. Iowa is getting more than 20 points and 15 rebounds a game in Big Ten games from Basabe, Olaseni and Woodbury and the depth gives the Hawkeyes plenty of options if one of the three is having an off night. Sophomore point guard Mike Gesell is Iowa’s third leading scorer in conference play with 9.6 points per game and his assist rate of 33.7 tops the league. Jarrod Uthoff, Josh Oglesby and Zach McCabe will all contribute off the bench. Oglesby, who was recruited to be a 3-point specialist, has found the range this season as he’s hitting close to 44 percent of his 3s in conference play. Both teams are excellent on the glass and at getting to the foul line, but Iowa is the far superior shooting team and is also significantly better at taking care of the ball despite playing the Big Ten’s fastest pace. Indiana is going to have to win this game on the defensive end as getting into an up-and-down contest with a team that can fill it up like Iowa is unlikely to yield favorable results. The Hoosiers were successful in devising a game plan to slow down another potent offense (Michigan) earlier this month, but that performance was also aided by a huge shooting night from Yogi Ferrell. The Wolverines were also a much weaker team defensively than Iowa is, so Indiana is going to need notable offensive contributions from more than just Ferrell. Pomeroy and Sagarin both like Iowa by six, while the Vegas line currently favors Iowa by four after opening at 3.5. Indiana is 3-3 at home in conference play thus far with wins over Illinois, Michigan and Wisconsin and losses to Northwestern, Michigan State and Penn State. When playing its best, Indiana can play with any team in the conference in Assembly Hall, but the Hoosiers have yet to play a game where they’ve entered with this much adversity. The Penn State collapse clearly carried over to Saturday’s blowout at Purdue. With young players playing major roles, there has to be a legitimate concern about confidence. That said, this is typically a spot where Indiana is at its best. The Hoosiers are the underdog and this is a primetime spot with ESPN in Assembly Hall. The NCAA tournament is no longer a realistic goal (short of a run through the Big Ten tournament), but there’s still plenty at stake in terms of the conference race and finding some positive momentum coming out of a disappointing couple of weeks. I know I am probably generally considered a complete downer, but I would not be at all surprised to see this ridiculous Indiana team beat Iowa tonight. Even though they seem to be on some kind of death spiral, that’s actually why I’m picking the Hoosiers tonight… BECAUSE they are apparently so completely overmatched. They’ve got Iowa right where they want them. It’s been that kind of year. As always, Go Hoosiers! I feel better and better the closer we get to tipoff. Here’s the question: do we run with the Hawkeyes, and thus expose our turnover issues … or do we attempt to slow it down, and thus expose our weakness generating halfcourt offense? Sure felt to me like we were having some success when we playing a bit slower and cutting back, at least a bit, on the turnovers. I’d be tempted to go that route. Wait, is that a trick question? Both answers seem bad. On another note please IU fans quit being so negative. Fans are not above the program. Just because your feelings are hurt that does not make it okay to (I believe) hurt the program. IMHO!!!!! I live in Iowa now and I’m really actually dreading this game. I’ll cheer for my Hoosiers as all but really have a less than favorable feeling about tonight. Still hoping and will yell loudly. GO HOOSIERS!! I think Iowa is the toughest game we play this season (thus far, maybe second to Syracuse). Win or lose, I’m glad our kids are getting experience against a first-rate team. Go Hoosiers. My feeling that Indiana is over matched in this game, is a product of how these two teams are currently performing. In the last games I have seen these two teams play, I watched Iowa destroy a very good Michigan team and Indiana get blown out by a bad Purdue team. But if you read my entire comment, you well see that I too am picking Indiana to pull the big upset tonight. So that’s kinda being positive, in my own way. I just want to make it clear, since I have apparently been branded a “hater” for my attitude towards CTC, that I still fully support these players as individuals, this team as a whole, and the Indiana basketball program. Because of this, I am pretty much in a no lose situation. If my admittedly negative feelings about Tom Crean’s coaching ability are proven out over time, then I will look like I know what I’m talking about. If I am wrong and Crean turns out to be an outstanding coach, then I may look like an idiot, but that means that Indiana has had great success on the court and has been returned to the promised land of championship basketball and elite status amongst it’s peers. Which is what we all want. knowing the way the team has been up and down this year, i would not be surprised with a 5-10 point victory or a 10-20 point loss. really cheering for the former. I feel like over half your posts recently have you mentioning other people labeling you a “downer” and a “hater”. While them doing that may be true, there comes a point when you should just accept it and stop making mention of same. Frequent posters/readers know what the deal is and that you bring more than just rhetoric to the conversation. Your skepticism on Crean is totally warranted, so even if you are wrong, no one is going to call you an idiot. Hopefully, we will get to this point because that would mean that the program is back on track! I vote we make shots tonight, especially layups. I don’t think we have a chance if we don’t shoot close to 45-50 percent tonight. This is a toughy tonight. They can run well, they rebound well, they take care of the ball, they have veteran leadership, etc. I didn’t think we’d beat Wisky or UM, so I will say that we have no chance to win tonight in the hopes that we pull out a big upset. Kind of sums up the last few weeks, huh? If in any way I contributed to making it sound like I thought you are a “hater”, I apologize. Tempers were running high last week, and I think in the end it just shows how passionate we all are about our program. No need to apologize. Once again, I must admit that I may, indeed, be the one that needs to lighten up. We are, of course, all in this together. Anyone who honestly thinks what you are posting on this site could hurt the program needs a reality check. If anything, I am just trying to let you know that you do not need to preface your thoughts with the aforementioned comments; the level-headed posters/readers know what is up. People assume I am a Crean detractor since I am critical of him, but that is not the case, and if anyone wants to assume I do not like him based on my criticisms, that is their own problem. Reading critically is a skill I assume too many people have, which is sad when I realize I am wrong in that regard. Keep on keeping on and lets get back to basketball! Normally don’t gamble on games involving the Hoosiers, but I was going to try to mush the Hawkeyes by betting on them since I’ve been able to slow down elite offenses with the dark rain cloud that is my action. But with the line at 4, all I’m probably buying us is a close loss. I would love to see Yogi get hot tonight, he and Stan could give their bigger/slower defenders problems. Go IU! If you’re going to turn the ball over 18 times, it’s probably better to have 60 possessions than 40! I’m torn on the slow down though – Crean’s offense performs much better when it’s high tempo (and, more importantly, high scoring). If we score more than 70 points, our winning percentage is right around 70% this season. If we score less than 60, we’re 1 for 6. I prefer to play the odds and say we go for the shootout. Like Ole Man warned before the Purdue game, Noah getting in foul trouble is one sure way to lose this one. Miss you Ole Man, I know you’re there. LOL! Gave me goosebumps. Go Hoosiers! Da dah, dah, dah, dah, DAAAAAAAAAH! I-U!!! Is metal falling from the ceiling of AH an omen? Game is postponed (darn, we were on such a role). And full recovery can take as long as several days.